Scientists and engineers in Germany have created the largest battery in the world with redox flow technology. Redox flow batteries are liquid batteries. 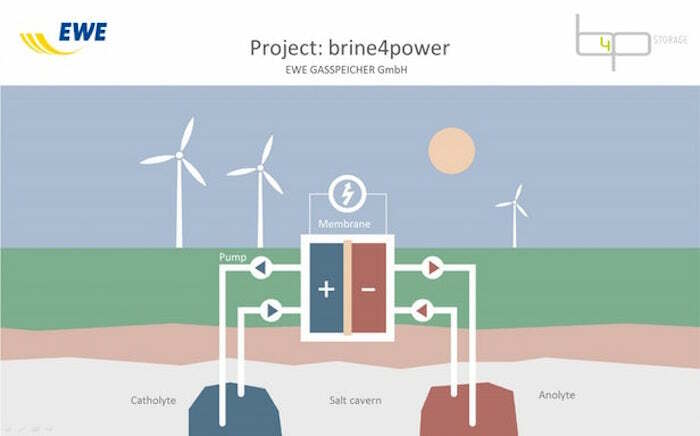 The Friedrich Schiller University of Jena has developed a new and forward-looking salt-free (brine) based metal-free redox flow battery. This new development will use salt caverns as energy storage. Schematic for salt-free (brine) based metal-free redox flow battery by Ewe Gasspeicher. Two caverns each have a volume of 100,000 cubic meters. A redox flow battery consists of two storage tanks and an electrochemical cell in which the reactions take place. Storage for solar and wind sources of power is an important challenge being explored in many ways today. Efforts such as this one provide a path to continue the rapid adoption of more solar and wind power. In the electrochemical cell the two storage liquids – catholyte and anolyte – are separated from one another by a membrane. This prevents the large storage liquids from mixing with one another. The ions, however, can pass unimpeded through the membrane from one electrolyte solution into the other. When charging the battery, the charging current ensures that electrons are deposited on the polymers of the anolyte. At the same time, the catholyte releases its electrons. The charged catholyte and anolyte molecules are pumped from the cell into storage containers and replaced by uncharged ones. When the battery is discharged, the reaction is reversed. The anolyte molecules emit their electrons, which are available as electrical current. Both charged electrolytes can be stored for several months. The maximum storage capacity of this redox-flow battery is limited only by the size of the storage containers for the electrolyte liquids. The project is being ramped up now, going through a test phase before bringing the full system online; they are aiming to achieve this in 6 years. The electrical capacity of 700 megawatt hours will be enough to supply over 75,000 households with electricity for one day. The only downside of adopting the metric system is less control over room temperature (based on my experience). Every ÂºC = ÂºF * 1.8 so have less control (when using only integers to control temperature as is the case in my experience). Granted this could be solved easily by using .5 (option in air conditioning and heating controllers but in my experience they don’t) for Celsius. For Fahrenheit this works out to enough control for me. For Celsius in a fair number (lets say 15%) of systems it is a bit uncomfortable. The specific circumstances add greatly to creating a problem. My guess is those that annoy me swing even further than 1 ÂºC, they move further in one direction in order to not turn on and off all the time. So maybe that moves to swings of 2 or 3 ÂºC at the measurement point. But that is another issue, the measurement on home (or hotel) systems is often 1 reader so the variation is often greater in other locations. Add to that the imprecision of their measures, I don’t have good data, but I am confident that the measurement error is fairly high. I am pretty comfortable at about 25ÂºC for air conditioning. But in some places I am cold at 27Âº and others I am warm at 23Âº. It could be me, but I don’t think so (most of the time – sometimes it is me). A long time ago I had some imprecise portable temperature gauge and while I wouldn’t stake my life on results based on it, it confirmed my feelings (when I felt it was warmer than the local reading said my device agreed and when I felt it was colder my device agreed). Hardly scientifically valid proof, but it made me more comfortable trusting my opinion on this matter anyway. My guess is in a unit using ÂºF you often can be 4 or 5 degrees off (or more) in different locations. For some people that might be ok. But for me that often starts to be uncomfortable. If you convert the issue to that time 1.8 it is noticably worse. Now in reality I don’t think it expands quite that much. While the manufactures balance the confusion of adding .5 to a Celsius controller and decide not to, I would think they don’t swing 1.8 times as far (in heating or cooling in order to not turn on and off all the time), but it is still let precise than using Fahrenheit integers. I believe (hope) they set their internal dynamics not based only on integers but could say for example turn off .5Âº past the setting and turn on when the conditions are .5Âº worse than the setting (so .5Âº too warm in the case of air conditioning, for example). It is still lame the USA fails to adopt the metric system, but reducing this problem in the USA is one small benefit of holding off 🙂 I wonder if 1 in a million, 1 in 10 million… up to 1 in 7.2 billion people (just me, all alone in the world) have my concern for the lack of precision of heating and air conditioners when using the metric system. The electricity to run huge server farms is enormous. One of the significant cost is air conditioning to cool down the server rooms. Google’s data center in Belgium, which was the company’s first facility to rely entirely upon fresh air for cooling, instead of energy-hungry chillers. During these periods, the temperature inside the data center can rise above 95 degrees. Google’s experience is the latest affirmation that servers are much tougher than we think. Many data centers feel like meat lockers, as servers are maintained in cool environments to offset the heat thrown off by components inside the chassis. Typical temperature ranges in data centers often range from 68 and 72 degrees. In recent years, rising power bills have prompted data center managers to try and reduce the amount of power used in cooling systems. The temperatures in Fahrenheit obviously. I was surprised that the servers don’t seem to need to be chilled to perform well. Chart showing global installed wind energy capacity by Curious Cat Science and Engineering Blog, Creative Commons Attribution. Data from World Wind Energy Association, for installed Megawatts of global wind power capacity. Globally 38,025 MW of capacity were added in 2009, bringing the total to 159,213 MW, a 31% increase. The graph shows the top 10 producers (with the exceptions of Denmark and Portugal) and includes Japan (which is 13th). Wind power is now generating 2% of global electricity demand, according to the World Wind Energy Association. The countries with the highest shares of wind energy generated electricity: Denmark 20%, Portugal 15%, Spain 14%, Germany 9%. 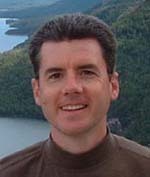 Wind power employed 550,000 people in 2009 and is expected to employ 1,000,000 by 2012. From 2005 to 2009 the global installed wind power capacity increased 170% from 59,033 megawatts to 159,213 megawatts. The percent of global capacity of the 9 countries in the graph has stayed remarkably consistent: from 81% in 2005 growing slowly to 83% in 2009. Over the 4 year period the capacity in the USA increased 284% and in China increased 1,954%. China grew 113% in 2009, the 4th year in a row it more than doubled capacity. In 2007, Europe had for 61% of installed capacity and the USA 18%. At the end of 2009 Europe had 48% of installed capacity, Asia 25% and North America 24%. All About Circuits is an online textbook covering electricity and electronics. Topics covered include: Basic Concepts of Electricity’ OHM’s Law; Electrical Safety; Series and Parallel Circuits; Physics of Conductors and Insulators; Solid-State Device Theory; Binary Arithmetic; Logic Gates; Switches; Digital Storage? It is a great resource. Enjoy.